Who's the cutest thing on four legs? Your pup, of course, especially if he's wearing this adorable lion costume anyone with basic knitting skills can make. 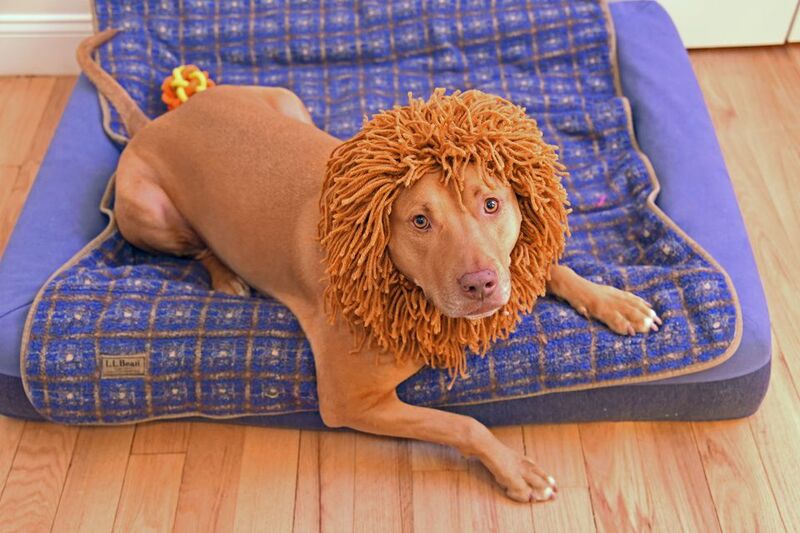 It's important to remember, if you want your pup to feel like the king of the jungle, his costume needs to be comfortable. That's why our lion-styled snood is made of soft yarn. The yarn and tools for this project cost less than $20. If you have a Michaels craft store nearby, you could save 20 percent or more with a store coupon. Medium or worsted-weight yarn appropriate for needle size US 8. Two 300 yard skeins should be more than enough for a large 75-pound dog. For the record, we used Caron Simply Soft yarn in persimmon. Crochet hook: You'll need one to add fringe. We used size H / 5mm. Your pup's head size. Here's how to get the correct measurement. Now subtract one inch. That number is your project's diameter. Your knitting style. Experience knitters know ​creating a gauge swatch is a must before starting a project. If you never knitted one in the round, here's how to knit a circular gauge swatch. When you're adapting the pattern, it's important to stick to multiples of four stitches, or you'll bark up the ribbing. To learn more, watch ribbing with circular needles. FYI, we share an alternate version of this pattern next. To adjust snood length add or subtract rows. The next two rounds create the ear openings. You'll need two measurements to adjust the pattern: Your dog's ear width at the widest point will determine the number of stitches you cast off and later cast on. Your dog's crown width between both ears will determine the number of stitches you knit after you cast off and also cast on stitches. Before we share how to create the mane, does your dog hate having his head covered? If so consider knitting this lion-inspired collar instead. Here's how to adapt our pattern. Measure your dog's neck at the widest point. Afterward, measure your dog's head using the method we shared in step four. Next, subtract one inch from the largest number for your project's diameter. Skip the section in the pattern for the ear openings. Grab your scissors and crochet hook. Cut your leftover yarn: You'll create fringe in three different sizes: short, medium and long. Your dog's proportions will determine each length. When in doubt keep the yarn on the long side. You can always trim later if needed. Create the hairline: You'll start adding fringe to the opening closest to the ear cutouts. Using your crochet hook add fringe to the first loop. Continue adding fringe around the entire opening for several rows. Work the crown: Next, fill the spot between the ears at the top of the snood with short fringe. Afterward, add short fringe around each ear opening. Start filling it out. Now add several rows of medium fringe directly behind the short section. Complete the beard. Add several rows of long fringe to the lower half. Here's how to add fringe around the ear openings. Now your pup is ready to rule as King of the Jungle (or Pride Rock, whichever you prefer).